We are top manufacturer of Auger Filling Machine. 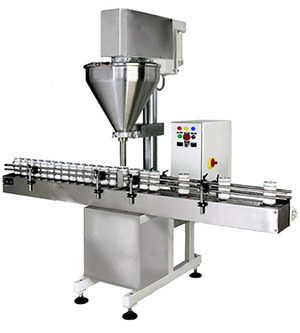 The Auger filler is Semi-Automatic Powder Filling Machine also known as semi automatic powder filler which is used to fill accurate weight size of powder in bottles, pouches. This machine is commonly used for powdery and dusty products. Our Auger Filling Machine and FFS Machine find application in pharmaceutical, Food, Chemical and pesticide industry. Auger filling equipments are used in chemical powder filling, milk powder filling, cocoa milk powder filling. The high accuracy achieved through this filling system is because of the accurate design of auger screw, latest technology based clutch brake and its latest micro processor control system. Auger Filler Machine is also available in servo motor based filler. Auger Type Powder Filling Machine. Elegant and Easy reach control panel for total control on operation. No Container Machine stop system.